Pocono Piranhas Swim Team Web Site: Complete YMCA and USA Swimming Team info. 1996 graduate of East Stroudsburg University with a Bachelor of Arts degree in Sociology/Anthropology. He has coached the Pocono Piranhas since the summer of 1990, starting as an assistant coach at the age 18. In the fall of 1991, he took over as Boys Head Coach until 1997 when he was appointed Head Coach of the Piranhas program. Since 1991 the team has grown from 60 members to over 130 strong with both boys and girls teams earning league, District and State titles. 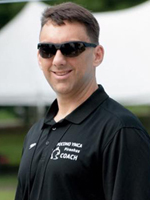 He is Certified in Principles of YMCA Swimming and Diving, YMCA Swim Coaching, American Red Cross First Aid and CPR, holds certification as a USA Swimming Coach, YMCA Swim Official, American Red Cross First Aid & CPR Instructor, and is member of and certified by the American Swim Coaches Association . 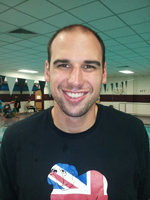 He has over 25 years of coaching experience and 6 years competitive swimming experience. Since 1990 he has coached the Piranhas to 92 League titles, 28 YMCA District Champions, 13 YMCA State Champions, 49 YMCA National Qualifiers, 54 YMCA Top 16/10 in the Nation Ranked Swims, 5 YMCA All Americans, 1 USA Swimming Scholastic All American, 3 Middle Atlantic Junior Olympic Open Age Group Championship Teams, 3 Middle Atlantic Junior Olympic High Point Winners, 2 YMCA National Champions, 2 Zone Select Camp Selections, 1 2 Eastern Zone Champions and a USA Swimming Disabled World Record Holder (Onel Ramirez JR) in the 200 Meter Freestyle. He was also selected to be the 2011 (13-14 Boys & Girls), the 2012 (11-12 Girls) Middle Atlantic All Star Zone Coach. The 2012 summer long course 11-12 girls were 1st place as well as the LSC was 1st place. Mike's swimming career began his freshman year at East Stroudsburg High School where he qualified for PIAA Districts and held several team records with the Cavaliers. During his last 2 years of high school he also swam with the Pocono Family YMCA Piranhas where he qualified for YMCA Districts. He continued to swim in college at East Stroudsburg University until the team was disbanded in 1990. Swimming is a family affair for Mike. He has three children, Emily, Zack, and Sydney are members of the Piranhas. His wife, Sonia, is the team's Parent Coordinator and Team Representative for the YMCA Penn Del Swim League. Mike resides in East Stroudsburg where he is an active community member and holds seats on local advisory boards. 2003 Graduate of Pocono Mountain East High School. Erika is a Piranha alumni who was part of the team for over 10 years. Erika’s swimming accomplishments include attending YMCA Districts and YMCA States, Qualifying for YMCA Long Course Nationals, Attending USA Junior Olympics, High School Districts and setting many records for the Piranhas as well as for her high school team. 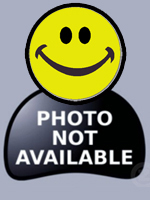 Erika has was a swim lesson instructor for over 7 years at Dansbury Park in East Stroudsburg. 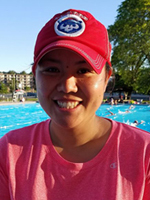 She has over 16 years of coaching and over 11 years competitive swimming experience. Erika is a certified Certified in Principles of YMCA Swimming and Diving, YMCA Swim Coaching and is also a USA Swimming Coach. B.J. 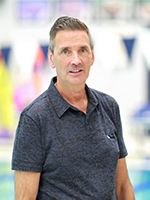 began swimming with the Piranhas at the age of four and has been a part of the team as either a swimmer or coach since then, giving him over 25 years of experience in the world of swimming. During his time with the Piranhas, he set multiple team records, won District, State and Junior Olympic titles, and qualified for Short and Long Course YMCA Nationals. He also garnered Top 16 times in multiple years. B.J. also swam for Stroudsburg High School, setting school records and earning Conference Swimmer of the Year for three straight years. He competed in Districts all four years and qualified for PIAA States his senior year and helped his team win two conference championships. He graduated in 2005 as the class salutatorian. He has been an assistant coach for his alma mater since the 2011-12 school year. B.J. is a graduate of the University of Pittsburgh School of Pharmacy, earning his Doctor of Pharmacy degree. He was also a 4 year member of Pitt's Swimming and Diving team, qualifying for Big East Championships all 4 years. During his tenure at Pitt, he also coached the club team Team Pittsburgh for 2 years. Ever since he began coaching with the Piranhas in May 2006, B.J. has gotten the chance to see the other side of swimming. He enjoys coaching because he is able to give back to the team that got him started in the sport. When he is not coaching, B.J. is a pharmacy manager for a local CVS Pharmacy and also enjoys being a member at Stroud Crossfit. I began coaching with PFY in October 2014 and I have lived in Stroudsburg since 1991. Presently, I am enrolled at East Stroudsburg University, studying to earn a Teaching Certificate in Earth & Space Sciences while also working on a M.Ed. in Secondary Education. I previously graduated from the University of Delaware with a B.S. in Geology in 2014, after having graduated from Stroudsburg High School in 2009. My competitive swimming career began in June 1999 when I joined the PFY Summer Swim Team (now Blue Gills). I continued with the Piranhas through 2009, regularly qualifying for Districts. In 2009, I was part of the Boys team that won the Penn Del B North Division and B Division Championship Meet titles. In addition, I represented Stroudsburg High School for the majority of my time in high school. In high school competition, I regularly qualified and scored at Districts while also regularly medaling at the conference level. I was a part of 3 MVC regular season championships and 4 MVC Championship Meet titles. Outside of swimming, I have participated in multiple musical and academic activities. Some of my best memories from these include performing in Dublin, Ireland with the University of Delaware Marching Band, qualifying for PMEA District Band, and earning 3 National Medals in Science Olympiad. 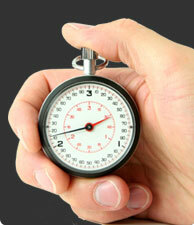 Have been involved in swimming for about 30 years, I really enjoyed coaching and working with swimmers of all age. I have a Bachelor of Physical Education from Beijing Sports University. China (2002), Master of Management from Massey University. New Zealand (2005). I am Fluent in both Chinese and English. When coaching at Lafeyette College one swimmer qualified for 2016 Olympic Trials. 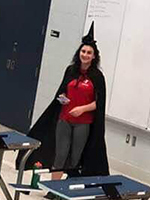 I began coaching with PFY in October of 2016 and am currently a student at East Stroudsburg University, studying Health and Physical Education with a minor in Athletic Coaching. I am also a graduate of Pocono Mountain West High School (2015). I have been around the sport of swimming since the age of 7, swimming my entire career with Pocono Farms and Pocono Mountain West. I began my competitive swimming career in 2004 with Pocono Farms Country Club in the Pocono Summer Swim League. I participated with that program for 11 years, helping me fall in love with the sport of swimming. I continued my athletic career into high school with PMW in my freshman year, becoming a distance freestyler. I would specialize in the 200 freestyle and 500 freestyle for the Panthers, making the district team in my junior year in the 500. In my senior season, I would transition to the 100 Breaststroke and 200 Individual Medley. Qualifying for PIAA District XI Championships in both events, along with the 500 Freestyle. I was also a member of the West’s district medley relay, at breaststroke. Additionally, I would represent Pocono Mountain West in my Junior and Senior seasons as team captain. As a coach, I have spent time working with Pocono Farms Country Club, primarily with their 11-12, 9-10, and 8 and under Age Groups. Also, I have worked with PMW as a preseason assistant, preparing the West Varsity program for the regular season. I enjoy coaching this sport because it gives me a way to give back. As an athlete, I was always a “team first” type of person, and coaching for me was a perfect fit. Coaching has given me a great connection with the younger generations of athletes, helping them grow as athletes and develop their skills. I also work with the YMCA as a lifeguard and swim instructor, and I am Lifeguard, First Aid, CPR, and AED certified via the American Red Cross. I am a 2016 graduate from Pocono Mountain West High School. I started swimming for the Pocono Farms Country Club Swim Team at the age of 4. I was also a member of the Piranhas for about 5 years. I attended YMCA Districts several times. I swam all 4 years in high school. I competed at Districts every year and was named Girls’ Captain my senior year. I started assisting the coaches for the Pocono Farms Swim Team at 13. I have given swim lessons to children of all ages and assisted many with special needs. Now, my love for swimming will continue outside of the pool. I am planning on attending college soon and majoring in the Medical field. Growing up on one of Long Island’s North Shore beaches, Kevin was destined to be a swimmer. He swam competitively as a child; then in high school for the Stony Brook Preparatory School and continued during college to swim at Florida. Kevin has two bachelor’s degrees from the University of Florida and a Doctorate of Law from St. Thomas University School of Law in Miami. He has two daughters, Giovanna and Giuliana, who are current members of the Piranhas swim team. Besides coaching with the Piranhas, Kevin is also a ski race coach with his wife Claudia for Camelback Mountain’s race team for whom their daughters are members. I started swimming competitively when I was in 1998 where I fell in love with the sport and the team. 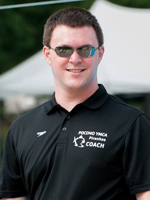 I started coaching the PFY Swim Team back in Fall 2007 but prior to that started working for the YMCA as a lifeguard and swim instructor in 2004. But i started life guarding as a junior lifeguard in 2002, for the Stroudsburg Borough Pool marking this year (2019) as my 17th year as a lifeguard. I also swam for the Stroudsburg High School Swim Team for 2 years. I am currently pursuing my Masters in Social Work. I graduated from Stroudsburg High School in 2007 and gained my BS in Media Communications and Technology in 2012. I currently also work for the Colonial Intermediate Unit 20 as an Associate Teacher in an Autistic Support Classroom. Working for the Pocono Family YMCA is just what it says in its name; a Family. And one that I have come back to multiple times after needing to take some time off for either due to school or maternity leave. 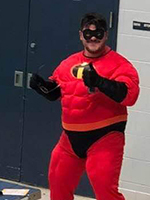 I have always found my way back to the YMCA and hope to continue to work for and serve the community with the YMCA as long as I am in the area.